NBC is learning how to present live sporting events on the Internet, but still has a way to go. 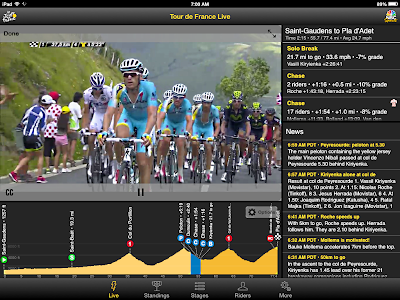 I've been commenting on the online coverage of the Tour de France and the Olympic Games for several years. 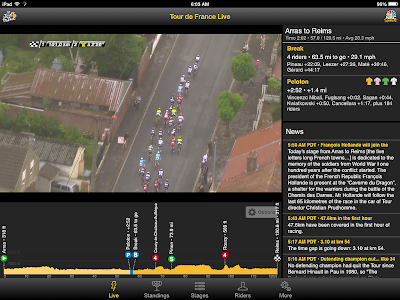 The BBC and IT4 in England have done a better job than NBC, but NBC is improving their sporting event coverage and I enjoyed this year's Tour using their iPad app. (They also have Web and Android versions). The text windows on the right scroll and nearly every object on the screen is a hot link. 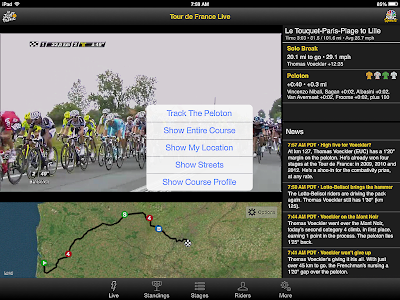 For example, touching the word Peloton below popped up a scrollable list of the names of the riders in the peloton. Touching the rider's name, would bring up data about him. Most objects are hot links. I spend most of my time watching live video, but frequently switch to one of the other modes to check the standings or to see how a particular rider, team or nation is doing. The stages mode is most interesting. It has facts about each stage and, more important, archives of the completed stages. 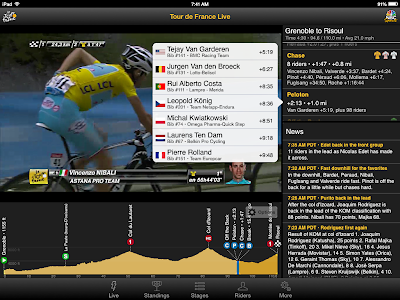 Shortly after a stage is completed, you can go back and watch highlight clips or the video of the entire stage and review the standings and other statistics. Finally, The biggest improvement over last year was not in the data presentation or user interface, but in NBC's offer -- I paid $14.99 and there were no commercials! The viewing experience was better than last year, but I'd still like to see several improvements. 1. As we saw above, the live presentation consists of a video stream and three data panes. The data panes and video are synchronized as long as you watch it in real time. If you pause the video for a short time, it "fast forwards" to the current live point, where it is in synch with the ancillary data. But, if you pause for a relatively long time -- maybe half an hour or an hour -- the video resumes where you left off, but the data stream reflects the current state of the race so they are out of synch. Check the following screen shot. 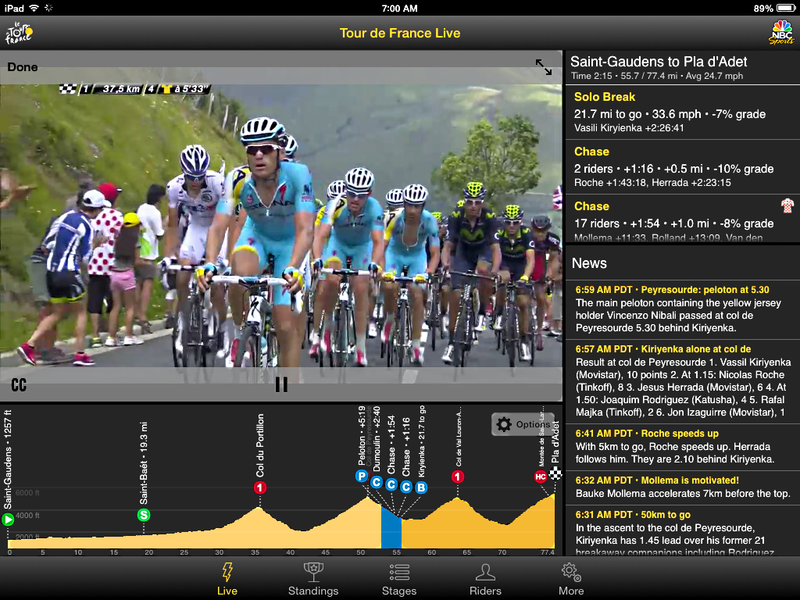 The riders in the video pane are climbing a steep mountain, but the course-progress pane at the bottom of the screen shows them on the subsequent descent (blue). The text on the right is synchronized with the course-progress map, so it is also out of synch with the video. The video and ancillary (bottom and right hand) material are out of synch. After pausing, you should have the option of picking up where you left off or jumping to the current point in the race. Either way, the video and ancillary material should remain in synch. 2. A complete archive copy of the video of a stage is posted shortly after it ends. That is good, but the ancillary material -- group positions and news posts -- is not available. Viewing the archive video is like watching a TV broadcast -- not an Internet performance. They should archive the synchronized data stream along with the video. 3. While watching the live stream or an archive stream, I'd like to have a single-touch, 15-second video rewind, as in the UK ITV4 viewer. 4. Similarly, I would like to be able to jump to the start of a video "chapter" with a single click or tap as you could with the BBC's player from the 2012 Olympic Games. A chapter might be something like the finals of the 100 meter dash in the Olympics or the sprint to the top of a mountain during the Tour de France. The person who is maintaining the ancillary news feed would create the chapter entry points as they posted the news updates. 5. The tablet interface is suitable for "leaning forward" -- switching modes and looking things up, but the small screen in your hands or lap is not so great for just "leaning back" and watching the race. I want to be able to mirror the video on my TV screen with a single touch. (This video is not from the NBC app because I have that installed on an iPad, not my phone). The video quality is good, though not excellent. The imperfection is most noticeable on text which is part of the video stream -- it is a little blurry around the edges. Static text looks fine from across the room. 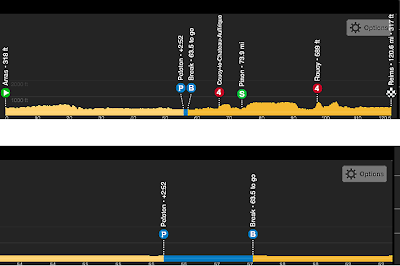 Chromecast mirroring works if you have a compatible phone or tablet, but, hopefully by next year, NBC will Chromecast enable their app, allowing for switching between leaning forward to display data, post tweets, etc and leaning back to watch the race on a TV screen. At first, new media mimic old media and NBC's earlier attempts at covering live sporting events online was shaped by their traditional TV coverage -- shoot video and insert commercials. This year, they have developed good ancillary data capability to go along with their video and dropped the commercials for a flat fee. Once they get the video and data synchronized and archived and I can lean back and watch the video or lean forward and play with the data, I'll give them five stars. My grandson Oscar will enter the 9th grade this fall and he and a friend are working their way through Algebra II at the Khan Academy this summer. No one told them to do it -- no one assigned it – they just decided to do it on their own. Have you used an online instructional website (e.g.,Khan Academy, Coursera) as assigned for a class? Overall, more than 40 percent of the incoming freshmen were frequently or occasionally assigned to use an online instructional website during the past year and nearly 70 percent had used online sites on their own. 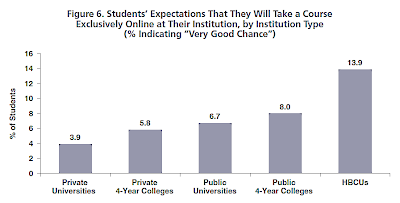 Digging a bit deeper, we see that students entering public schools were a little more likely to have online experience than those entering private schools. (Public colleges and universities also offer more online instruction). To me, the most interesting finding was that students entering historically black colleges and universities are much more likely to have online education experience -- on their own or assigned -- than the typical incoming freshman. I could speculate on the cause of this discrepancy, but it really requires further research. Students who chose to independently use online instructional websites are also more likely to exhibit behaviors and traits associated with academic success and lifelong learning. My grandson Oscar and his friend may be ahead of the curve, having been assigned Khan Academy lessons while in junior high, but it looks like today's kids know the Web is good for school work as well as playing games, posting selfies and building Minecraft worlds. 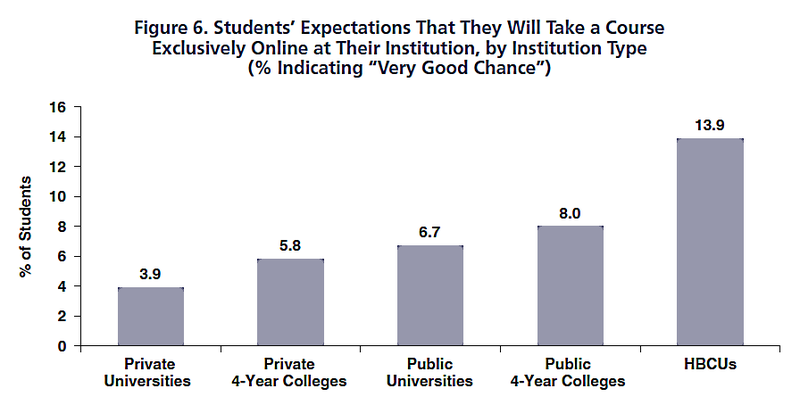 Students were more likely to take an online class on their own than as part of an assignment. Freshmen at historically black schools were more likely to have taken an online class than others. Online study increased more rapidly between 2014 and 2015 than during the previous year. This table shows the averages for all schools combined -- it clearly shows the increased use of online material. The survey focuses on students taking classes from online sites like Coursera and the Khan Academy. If you are unfamiliar with them, check out this interview of Coursera co-founder Daphne Koller and this interview of Khan Academy founder Sal Khan. The interviews are from the Chronicle of Higher Education re:Learning podcast, which is part of their re:Learning Project. I also forgot to add a link to my post on last year's (2015) survey -- it's here. Comcast executive apologizes for obnoxious phone call to a customer service rep -- ex customer rep says it was in line with company policy. Last week this bizarre recording of a call to a Comcast phone representative requesting termination of service went viral. (You can listen to the first couple minutes then stop because it is repetive to say the least). Great -- except that Lauren Bruce, a former Comcast customer account executive says the customer service rep in the recording was not going rogue, but adhering to company policy. Bruce says the Comcast rep in the recording was trying to upsell the caller and also complete a mandatory questionnaire they had for each call. She says it was sometimes easier to make up answers than get them out of irate customers and that the customer rep in this call is being made a scapegoat. This call recording with a Comcast rep makes my experience with Time-Warner Cable look good. It's no wonder the Internet Service Provision is the lowest rated industry in the United States according to the University of Michigan Customer Satisfaction Survey. Here is a copy of the Comcast retention representative handbook -- the call rating system encourages them to be persistent and -- "take control, ask targeted questions, make an offer", etc. I'd hate to have their job -- it's like working on an electronics assembly line. NBC is learning how to present live sporting events on the Internet. 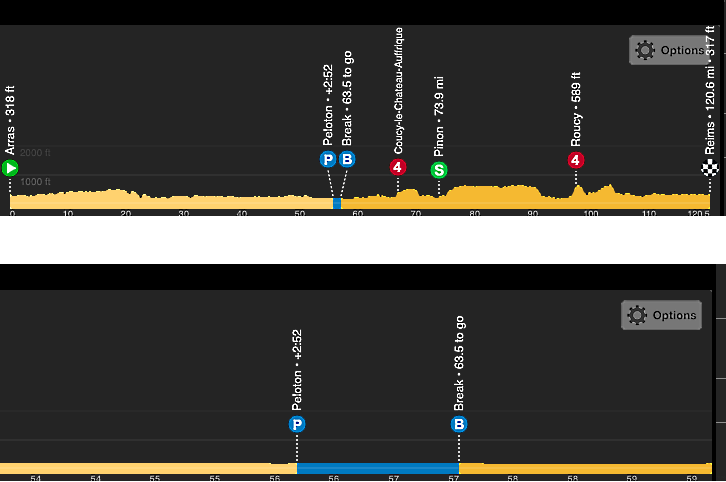 I've been commenting on the online coverage of the Tour de France and the Olympic Games for several years and the BBC and IT4 in England have done a better job than NBC ... until now. This year, I am watching The Tour using NBC's iPad app, and I like it a lot. (They also have Web and Android versions). The viewing experience is good, but I'd still like to see some improvements. One would be adding a single-touch, 15-second video rewind, as in the UK ITV4 viewer. Another would be showing the text frames -- group positions and news posts -- along with the archived video of the completed stages. (Currently you can only replay the video stream). There's also some missing data -- the rider database includes a biography field, but it is not populated. Finally, the tablet interface is terrific for "leaning forward" -- switching modes and looking things up, but the small screen in your hands or lap is not so great for just "leaning back" and watching the race. I want to be able to mirror the video on my TV screen with a single touch. If I had an Apple TV, I could do that now with my iPad. My YATS Podcast buddies tell me that Google is updating their Chromecast app to enable mirroring the screens of selected Android phones and tablets on TV sets equipped with a Chromecast device. Better yet, how about NBC Chromecast-enabling their app? As I said at the start, I like this experience a lot. Some part of that is attributable to NBC's app and some is due to the inherent nature of a tablet and touch interface. I also like NBC's offer -- I paid $14.99 and did not have to watch any commercials. By next year, I expect to have a five-star setup for watching The Tour -- while leaning forward and while leaning back. 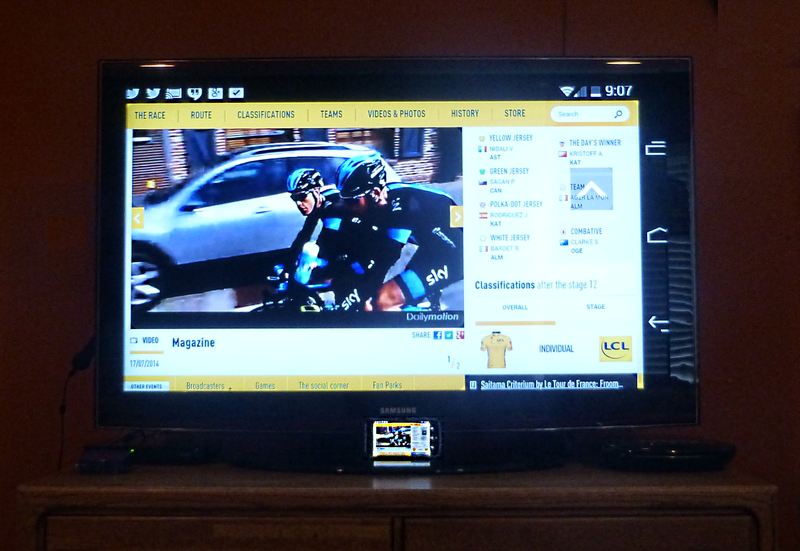 I said one missing feature was the ability to sit back and watch race video on a TV set. Yesterday, I received an update to the Chromecast app that enables mirroring of an Android screen on a Chromecast-equipped TV set. As you see here, I can now cast my phone video to my TV set. This new version of the Chromecast app is labeled "beta," and it is a bit glitchy. I had to reboot the Chromecast a couple of times to get it to work. When it is working, the video is quite acceptable, though not perfectly sharp. The imperfection is most noticeable on text which is part of the video stream -- it is a little blurry around the edges. Static text looks fine from across the room. This brings us a step closer to the complete leaning forward and back experience for watching live sporting events -- closer to a five-star review. NBC has populated the biography field in the rider database and it is now displayed. That was an easy suggestion to satisfy, but the others will require some re-architecting of the system to provide access to a buffered version of the video in real time. 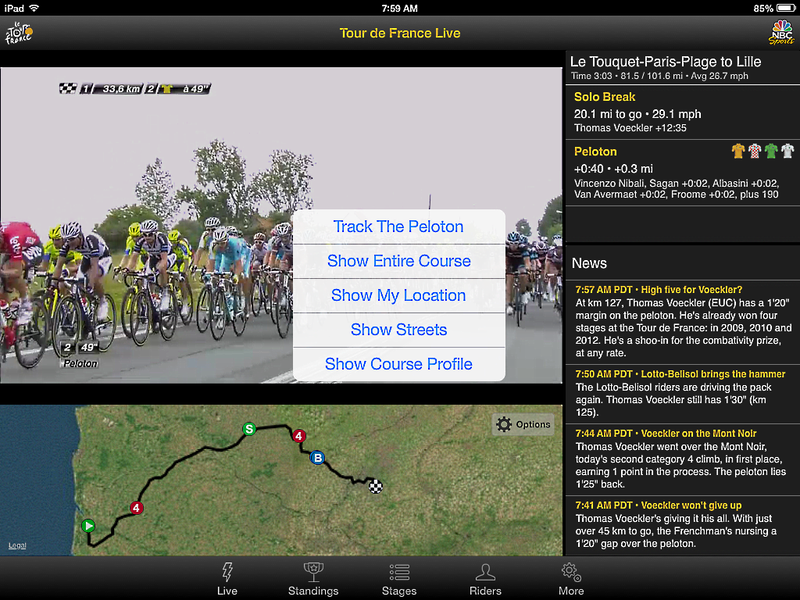 I stated that my biggest criticism of NBC's iPad app was that archived replays of the video coverage of completed stages are not accompanied by the synchronized course map, news feed and dynamic standings of the live coverage -- if you miss a live stage, you cannot replay the full experience from the archive. I've now discovered a similar synchronization problem during the live presentation. If you pause the live playback for a short time then restart it, the video fast-forwards to the current live point, synchronizing with the ancillary material, but, if you pause for a long time, the video does not catch up with the ancillary material so they are out of synch. That will cost them a "star" in my rating -- let's cut it to three stars. My next desktop will be a Chromebase -- a Chrome-based all-in-one -- will yours? My next desktop will be an LG Chromebase or something similar -- how about you? A while back, I reviewed an Acer Chromebook, comparing it to my Windows laptop and a tablet. While the laptop remains my main computer, the Chromebook easily beat the tablet for my application mix. 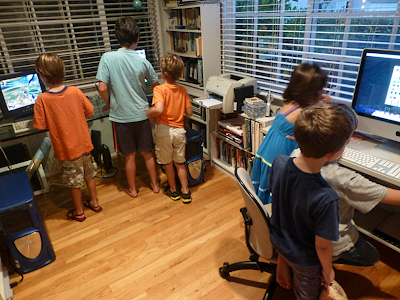 (More worrisome for Apple, my 10-year old grandson agreed -- he liked the Chromebook better than his iPad). But, now we have a new entry, the LG Chromebase, an all-in-one desktop running the Chrome OS and browser. How does it stack up against my laptop, tablet and the Chromebook? Where does the Chromebase fit in? The bottom like is that my next desktop will be an LG Chromebase or something similar -- like a chromebox with a good keyboard and display. To understand why, check out the following picture of my current desktops -- two old tower PCs running Windows 7 and an iMac. The towers are used as kid arcade machines and the iMac is used for Web surfing, email, Skype calls, video Hangouts and kid games. That's it. No resource-intensive applications like video editing. (Time Warner's Internet connectivity can get in the way of those video Hangouts, but that is a different rant). I've not used a Chromebase, but, based on my experience with the Chromebook, I am confident that a Chromebase with 4 Gbytes of memory could handle all of my desktop applications. It would run them as fast as the desktops, boot way faster, be more reliable, and, most important, be locked down. Look back at the picture of that room full of little kids playing games -- how frequently would you guess they click on some bogus link and download some cool-sounding program that turns out to be crapware or worse? Of course, all this holds for my desktop applications, but it may not for yours. What if there were a good, Chrome-based version of Microsoft Office -- would that do it for you? Still not satisfied? How about the equivalent of an audio editor like Audacity and an image editor like Paint.net? That would not be enough to get me to give up my laptop, but it would be getting close. Microsoft has released Office for the iPad (too little too late?) and will soon have an Android version. Is a browser-based version be far behind? In December 2008 Bill Gates wrote a memo warning that "allowing Office documents to be rendered very well by other peoples browsers is one of the most destructive things we could do to the company." In January 2010 Steve Jobs predicted that "The world is moving to HTML5." In September, 2012, Mark Zuckerberg said "I think the biggest mistake that we made, as a company, is betting too much on HTML5 as opposed to native ... because it just wasn't there." (Yet). I think they were all right -- the trick is getting the timing right (like the Mac, not the Lisa) -- LG thinks the time is right about now. 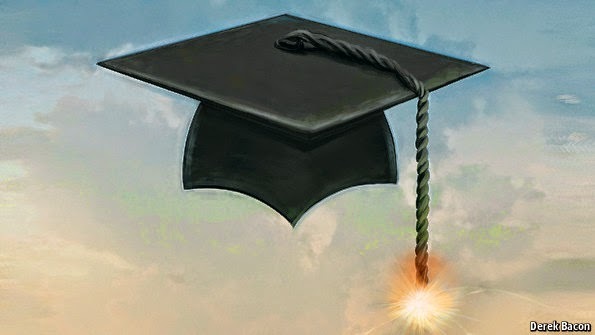 The cover theme of The Economist this week is "creative destruction in education." Creative destruction: A cost crisis, changing labour markets and new technology will turn an old institution on its head. 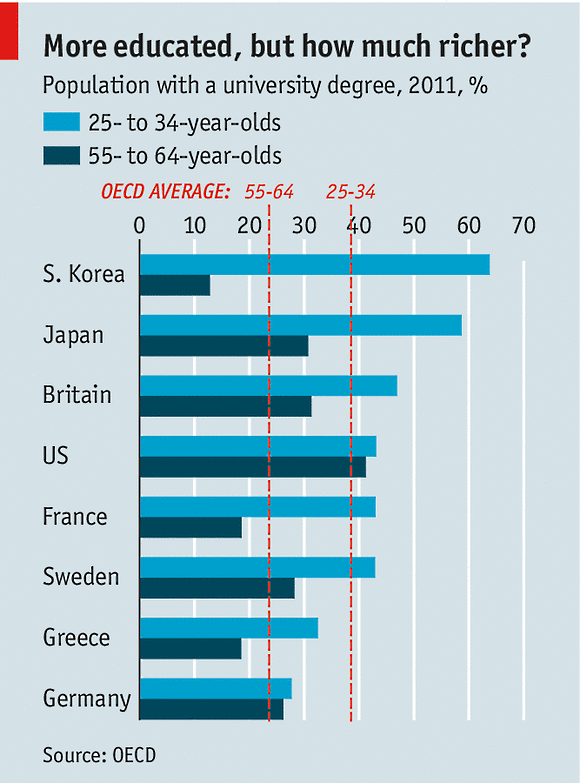 The digital degree: The staid higher-education business is about to experience a welcome earthquake. A winning recipe: Two big Brazilian education firms, now in the process of merging, show how universities can do both quantity and quality. 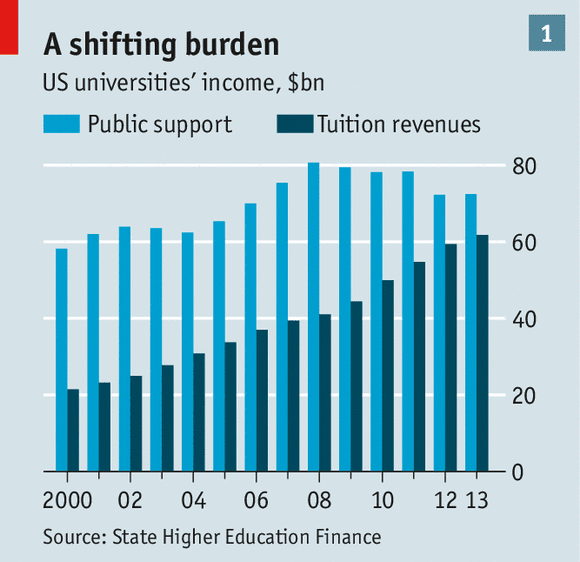 Wealth by degrees: The returns to investing in a university education vary enormously. The articles survey trends and developments and speculate on the future of both elite and mass-eucation universities. For example, at MIT over half the 4,500 students take a MOOC as part of their course and half of their edX (MOOC) students come from developing countries. Anant Agarwal, who runs edX, proposes an alternative to the standard American four-year degree course. Students could spend an introductory year learning via a MOOC, followed by two years attending university and a final year starting part-time work while finishing their studies online. 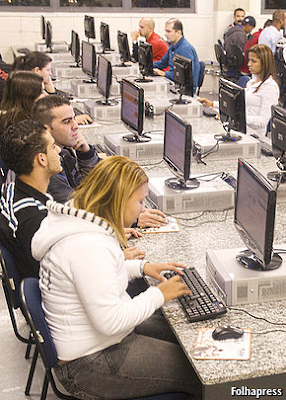 In Brazil, private universities, are enjoying success with innovative blends of online, televised and in-person classes at widespread locations. At first they had the same sorts of problems as US trade schools face today, but they are now succeeding at offering effective, low-cost education. 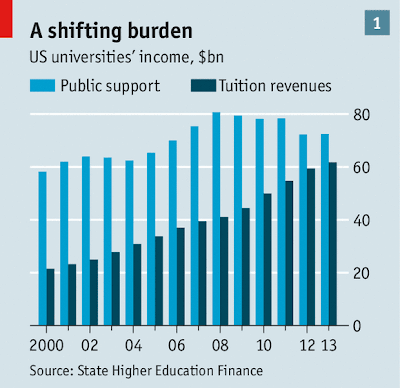 Public support is falling and tuition rising. 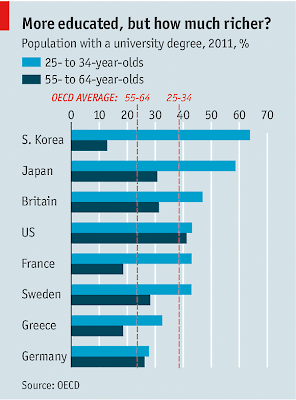 but South Korea is the leader today. In an earlier post, I described the difficulty of discovering options in a touch interface and the silliness of porting that problem to non-touch devices like laptops – and I suggested a solution. That was a big, general problem, but there are also many small, specific UI glitches. Here are two, one from Apple and one from Microsoft to keep things even. Let's start with Apple. I just “upgraded" iTunes for Windows. Before the upgrade, I saw a simple Refresh All button in the lower right corner of the screen. About once a week, I would launch iTunes, click that button and it downloaded the new episodes of the podcasts I subscribe to. After the “upgrade,” the refresh button was gone and I did not see anything like it. I went to an Apple help forum, where, someone had asked about the same problem and learned that the refresh capability was still there, but one had to select the List tab then click on the unlabeled circular arrow in the upper left corner. Well hidden Apple! Here's a UI glitch from Microsoft -- I put my Windows laptop into Sleep mode several times a day. To do so, I click on the Start button then slide the cursor over to click on the small arrow to the right of the Shut Down button, slide the cursor to the right and click on Sleep. That usually works, but since I am doing all of this with a trackpad and the arrow is small, I screw up and accidentally click Shut Down about once a month – wasting time and perhaps losing data. Do some minor UI problems bug you? Let me know what they are in a comment.